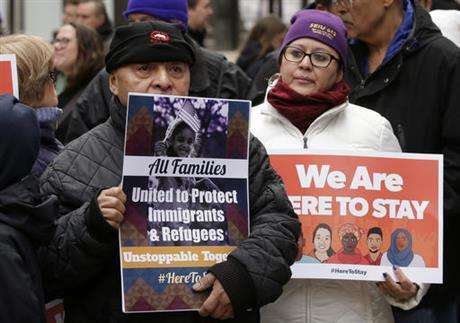 On Tuesday, the Pew Research Center reported that the number of immigrants staying in the United States without permission fell to a ten-year low in 2016. Researchers used government data to show that from 2007 to 2016, the number of undocumented immigrants dropped from 12.2 million to 10.7 million. Pew linked the decrease to a large reduction in the number of Mexicans crossing the U.S. border illegally. However, the number of immigrants from El Salvador, Guatemala and Honduras trying to cross over from Mexico illegally was up. Central America is the only region for which there was an increase in undocumented immigrants during the period of the study. Arrests of Central Americans at the U.S.-Mexico border have also risen. But Pew researchers said arrests remained well below their highest number in 2014. Researchers found that two-thirds of adult unauthorized immigrants have lived in the U.S. for more than 10 years. Most unauthorized immigrants enter the U.S. on legal visas and remain after their visas reach the end of the period of stay they permit. The latest overstay report showed that more than 700,000 holders of visas whose time limits had been reached should have left in the 2017 fiscal year. Pew said 90 percent of overstays were from countries other than Mexico or Central America. Pew noted that forced expulsions – called deportations – of undocumented immigrants rose during the years when George W. Bush and Barack Obama were president. Deportations reached their highest point in 2013. These deportations could have affected the decrease in the undocumented population. In the fiscal year 2016, most deportations were of people from Mexico, Guatemala, El Salvador and Honduras. The report showed that based on limited data, deportations appear to have declined since then. It also shows a decline in those arrested at the U.S.-Mexico border, as well as an increase in those arrested inside the United States. The place is rife with smugglers, dealers, undocumented immigrants, and slaves. Despite limited data, several studies reveal information on the cost impact of drowning. 5.The report showed that based on limited data, deportations appear to have declined since then. Since then I've been waiting on events. 6.Pew said 90 percent of overstays were from countries other than Mexico or Central America. She makes no reference to any feminist work other than her own.